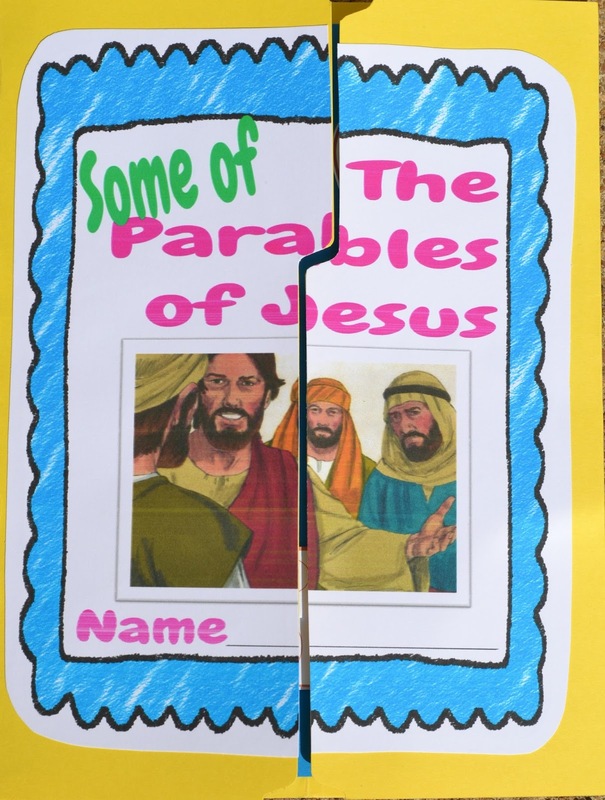 This week's lesson are three parables from Jesus. These are the visuals I set up. The barn is a bird house I found at a craft store and painted. I found the grain stalks during the fall and added some Fisher Price fencing and more bales of grain. The Pearl of Great Price is a basket with larger (8 mm) pearl beads. The treasure is a wood box that I found at Hobby Lobby. I just used brown fabric (or felt or actual dirt). I let the students have a treasure chest, added a pearl bead and a grain stalk. Then, add stickers of Jesus, the Bible, Heaven and discuss what real treasure is. 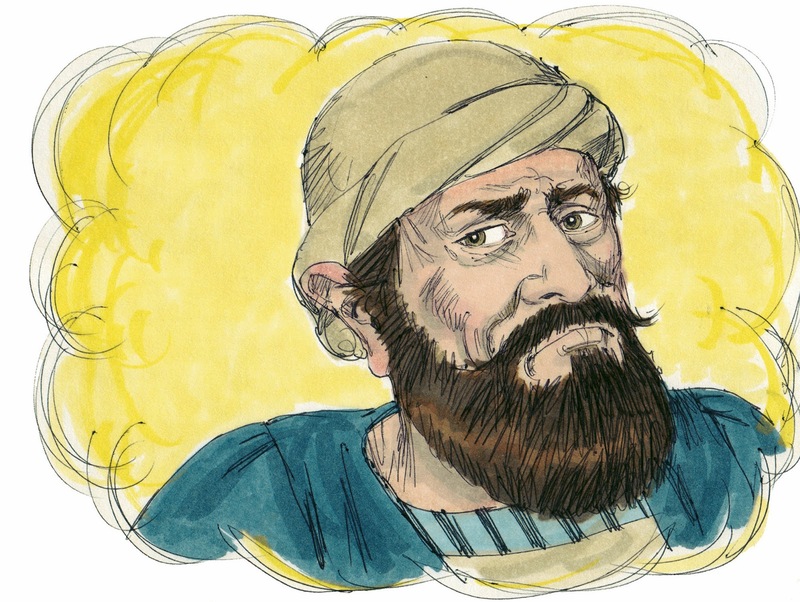 In Jesus’ day, usually when a father died, the oldest son inherited two times what the other children received. There was crowd of people where Jesus was teaching and someone said to Jesus “Teacher, tell my brother to divide the inheritance with me.” Jesus asked him who made Jesus the judge? Jesus isn’t here to settle these problems, He wants to preach the gospel. Jesus said to be careful of being greedy because your life isn’t about having an great quantity of things. The rich man told himself, I’m going to do this… I will tear down the barns that I have and build BIGGER barns. That’s where I’ll store my crops and property. And I will say to myself, You have so much stored up, enough for many years. I’ll take it easy and celebrate! But God said to the rich man, “You’re a fool! Tonight you will die, then who will prosper from all your possessions?" There are a lot I’s in today’s parable.. vs. 21 “So is he who lays up treasure for himself, and is not rich toward God.” Jesus told them not to worry about THINGS, but our Bible verse for today says: “For where your treasure is, there your heart will be also.” Jesus is telling the people, what good does it do for you to make a lot of money, and save it and not help others and give back to God? This rich man should have thought about who needed his help, since he had more than he needed. Let's look at two other short parables that Jesus told in Mathew 13:44-46. They tell us about how great the kingdom of Heaven is and how our whole goal should be to go there. 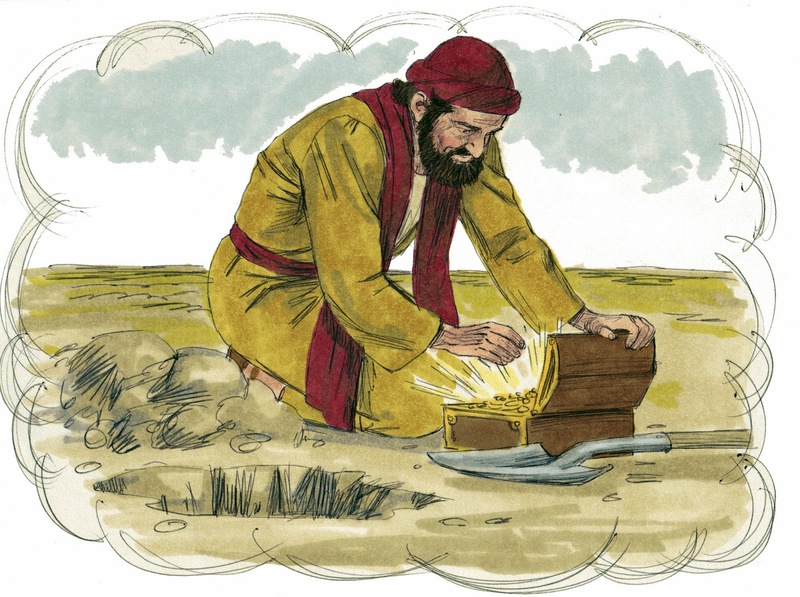 This first parable is about a man that found a hidden treasure in a field. The man hid the treasure, then he went and sold everything he had so he could buy that field. Since he now owned the field, he also owned the treasure! It was worth the cost to sell everything he had! 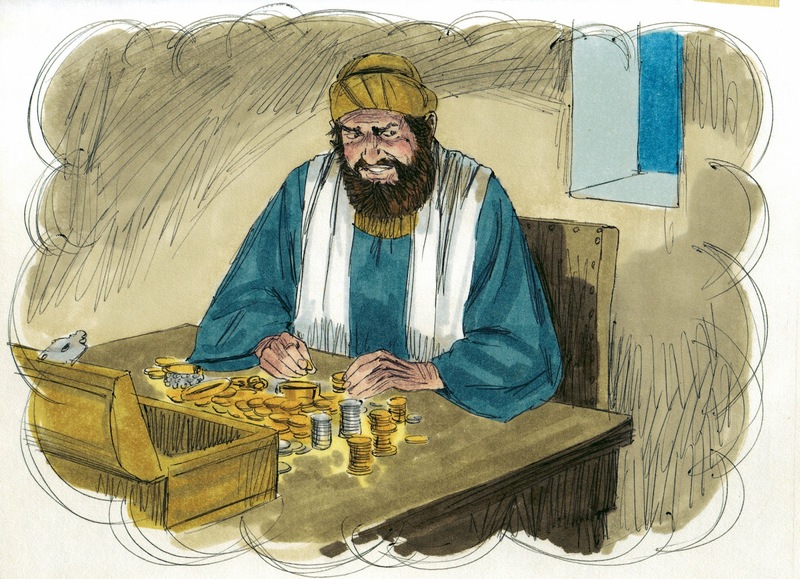 This next parable Jesus told is about a merchant. He was looking for beautiful pearls. 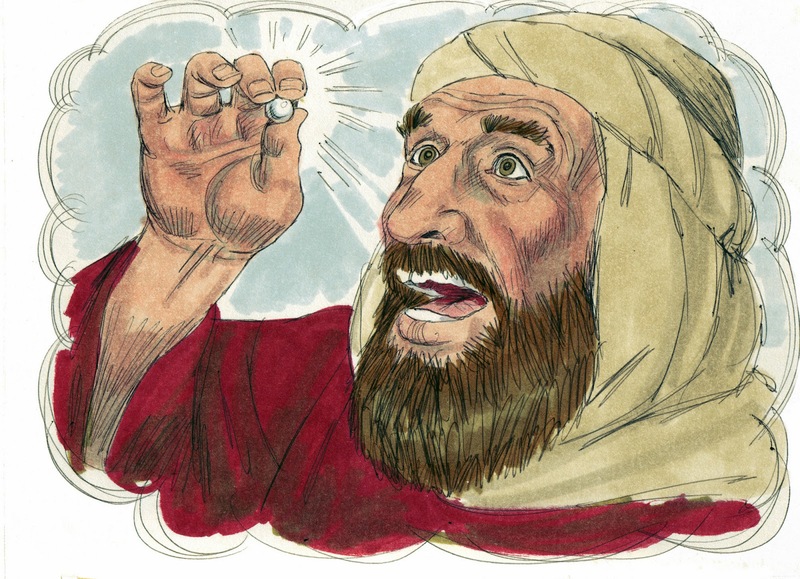 The merchant found a pearl that was worth a lot of money! The merchant sold everything he had, just so he could buy that one pearl! Jesus, said it is worth giving all you can to enter the kingdom of Heaven! All of these parables are telling us to make sure we have our priorities in the right place, and Jesus said that it worth giving up all the worldly stuff to go to heaven. This project requires some work on the teacher's part before class, but it is a great discussion starter. I left some of the jewels blank for the students to add thoughts that are brought up during the discussion. You can print it here. This is another printable to be used with the Parable of the Rich Fool. It is a discussion starter for 'Do we really need it' things or 'Do we just want it'. This is available in color or black & white. You see the main chart on the left. The kids can stack the hay bales on the correct side as you discuss each 'thing'. There is also another page of just blank hay bales for the students to write different items on. If you don't want to print the hay bales, the students can just write different things under each header. Click here to download the color and black & white. Click here for lapbook printables. Today's Bible Verse: For where your treasure is, there your heart will be also. Luke 12:34 (NKJV) Click on the picture to print the NKJV Bible Verse & Teacher's Visual. These are awesome, Debbie. I dig the printables and love your teaching heart. Thanks for sharing this over at #EverydayJesus. Thank you Sharita! I appreciate you hosting! GREAT post!! Love the graphics you shared. Thanks for sharing with What You Wish Wednesday. Come back this week. Thank you Leslie! I appreciate you hosting! This is wonderful! Yay! Thanks, neighbor. May God bless you richly!